This set features six, intricate silver mini lanterns with translucent windowpanes, each revealing a twinkling, holographic star. Hang from branches or arrange along pathways and porches for a festive touch to any outdoor gathering. PARTY DECOR – Includes 6 tiny silver lanterns with a glowing 3d star light in each. 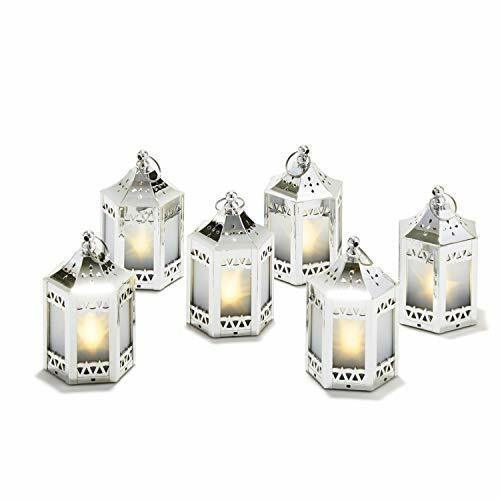 This decorative miniature lantern set is a perfect centerpiece for your wedding, bridal shower, housewarming or Ramadan celebration. FLICKERING GLOW – The single LED inside the lantern provides warm and inviting light. The unique holographic star lights create an ambient flicker effect. | Color temperature: 2200k. MINI SIZED – The small, lightweight lanterns are designed for either hanging or tabletop display. Lanterns include a top ring to easily hang. | Dimensions: 2.75″ D by 4.5″ H.
BATTERIES INCLUDED – One CR02032MAX button battery is included inside each lantern. The batteries are pre-installed for your convenience, simply remove the battery tab and enjoy! WARRANTY – LampLust is looking out for your satisfaction. Please contact us through seller messages for all questions or concerns. These Mini Silver Holographic Lanterns have a 90-day Warranty.